This entire second half of this section provides good views to the east that complement the views from the section terminus, the mirador on Cerro Alto / Majimachi. (The prominent mountain called “Cerro Alto” (Spanish for “High Mountain”) on the Mexican government’s map is also called Majimachi by the Chihuahua State tourism organization.) It starts at the point where the gas pipeline passes through the small Tarahumara settlement of Nacayvo Sur and generally follows Highway 77 (at a distance) up to the final hill before Divisadero. The railroad turns to the West at Nacayvo Sur and remains somewhat distant from the Camino all the way to Divisadero (7 kilometers along the highway). 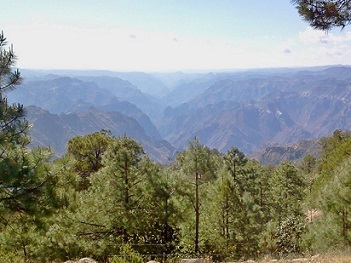 Nacayvo Sur is a small Tarahumara rancho (as of 2016) being overtaken by the new gas pipeline connecting the Chihuahua area with the Pacific Coast. The community’s small rustic houses are approximately 15 meters below the pavement of Highway 77. From the highway crossing a steep rocky 4WD road descends toward the pipeline. This is the start of Section 11. After descending 50 meters, the Camino turns sharply to the right through rocks and trees along a water course that runs parallel to the highway 20 meters above. The trail runs along this water course (often dry or with little water) for 150 meters, where it crosses the stream bed and rises into another forested area on the east side. The trail runs 500 meters on a pleasant tree-lined path parallel to Highway 77 (approximately 50 meters to the right). As of 2016 the Camino crosses back over the water course (bending right) and up to the highway where it crosses the gas pipeline route. The pipeline has itself been on the left and above the Camino since leaving the Nacayvo Sur hamlet. After crossing the pipeline (850 meters from the start), the Camino bends sharply left on another country dirt road that winds through the woods up the hill to the east of the pipeline. There many interweaving paths and roads in this section. 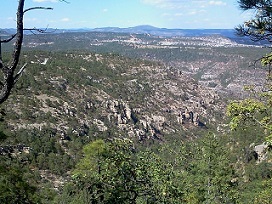 It ascends 100 meters over a distance of 1.5 kilometers where it passes a lone Tarahumara house in a field on the right. Shortly beyond the field, the Camino makes a sharp right turn to continue around the house toward the South. 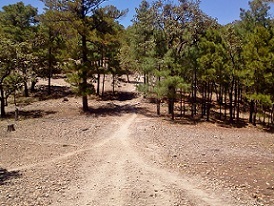 The trail descends slightly into a complex intersection of Tarahumara trails and country roads. The Camino is the rightmost (western most) trail that slightly rises as it skirts the slope of the next ridge. The Camino hike is a pleasant walk on a forested path through the trees with the downslope on the right. After 400 meters it drops slightly to another stream bed, and, after crossing that stream (usually dry), it rises again following the uphill route of the water course. After another 400 meters the Camino bends left slightly to the stream as it drains from a large Tarahumara cornfield. 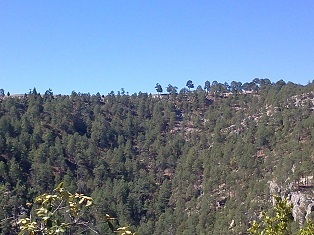 The trail makes a hairpin turn to the left and ascends through the trees diagonally up the slope of the adjacent ridge. The Camino is again a pleasant path through the trees. After 200 meters it passes through a fence gate and continues into a very large treeless field with wide views directly east over the canyons. 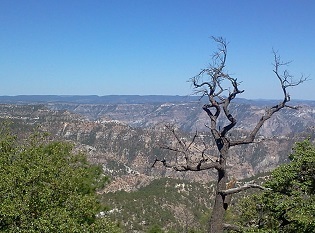 Tarahumara villages are visible on distant mesas on the other side of the canyons. 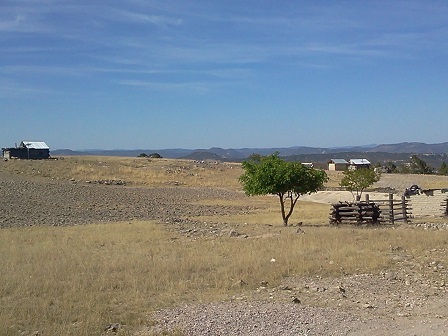 A Tarahumara farmhouse is slightly below on the left at the field’s edge. This field is the largest on the Camino. 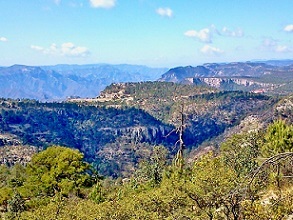 At its upper reaches there are a few Tarahumara orchards on both left (below the trail) and right (above). At 3.6 kilometers from the start, in the middle of the open field, the Camino turns sharply right and up a slight grade to meet another trail. At that intersection it makes a hard right turn onto a well-defined trail going uphill. Immediately after passing the upper orchard on the right, the Camino turns left, goes uphill to a small gate in the fence line. The pine forest begins at the fence. The trail then turns sharply left (90 degrees) and follows the fence line over the ridge. There it intersects a well-defined trail and bends right. 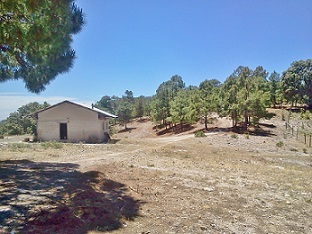 As the Camino descends from the forest, it enters into a rocky flat area with an isolated Tarahumara farmhouse on the left (4.0 kilometers from the start). To the right is a large cornfield that fills a small shallow valley. From the Tarahumara house the Camino bends right along the cornfield onto a clear path that ascends slightly through the trees. Immediately to the left is a country road that runs parallel to the Camino. Hikers can easily walk on the road if they prefer since it joins the Camino’s path in 150 meters. The field in the valley can be seen over small trees on the right. Above the cornfield there are a number of interweaving roads and paths. As a result, hikers should be careful to take the leftmost path out of this complex and confusing set of trails. The left trail is the Camino. For the next 800 meters it is a forested trail that skirts the eastern side of the hill rising on the right side. Views from this remarkably flat path over the canyons to the left (East) are good. After 700 meters along the flat section of the trail it rises toward the mesa, first gradually, then more steeply. 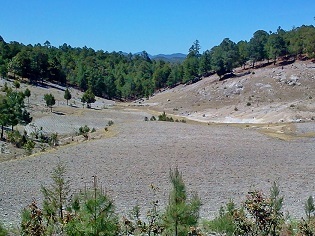 At 800 meters there are a series of forks that bend left toward a Tarahumara well. 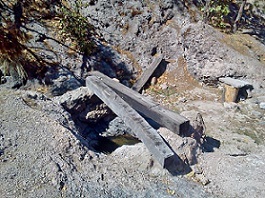 Although this well is visible and accessible from the trail (approximately 20 meters to the left and below), it is not on the Camino itself. Instead of bending left toward the well, the Camino stays to the right and ascends steeply through trees and rocks to a small corn field below Cerro Alto. Highway 77 is only 50 meters away across the field to the right. An unused building with a red roof is visible at the corner of the field next to the highway. In 2016, an abandoned car is mounted on blocks in the middle of the field. The field is 5.0 kilometers from the starting point. 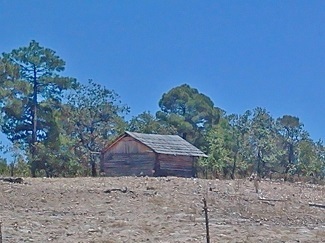 As the hiker reaches the cornfield, a Tarahumara house is directly in front. The Camino turns left onto an access road to the house, and then further left into the forest and over rocks in a series of confusing switchbacks. Care and attention will be needed to stay on the Camino in this short section. The trail then rises to the left with another larger cornfield on the right. The Camino meets a barbed wire gate on the upper fence line of the cornfield. Hikers can also see a microwave tower on the opposite site of the field. 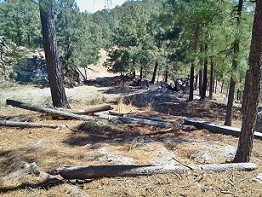 After going through the gate, the well-defined trail rises through the trees to meet the formal access road to the Cerro Alto mesa (5.6 kilometers from the start at Nacayvo Sur). 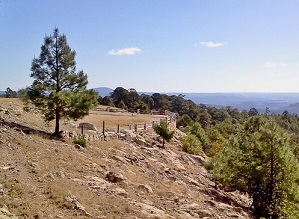 The Camino turns left onto the rough 4WD access road and rises the final 20 meters to the top of the Cerro Alto mesa. At the summit is a large open area (5+ hectares) with only a few trees, primarily on the south edge. 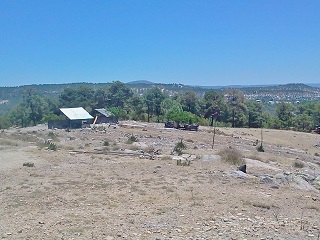 On the east and north sides are a few Tarahumara houses and cornfields. 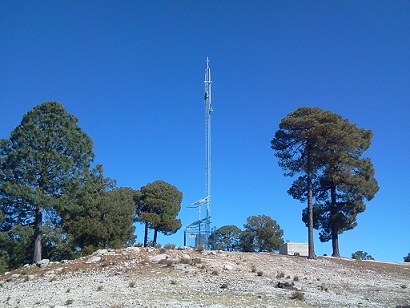 On the west side of the summit is a small radio tower (with support building) on the topmost point. The eastern edge also features the mirador that is well constructed but now in a state of non-use and disrepair. However, the views from the mirador (which is safe) are very good. Under the trees on the southern edge of the summit is a handicraft center (now also not in use). 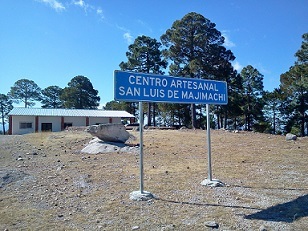 The center is a white building marked with a large blue sign as the ”Centro Artesanal de San Luis de Majimachi.” (San Luis de Majimachi is the name of a nearby village that owns the land.) 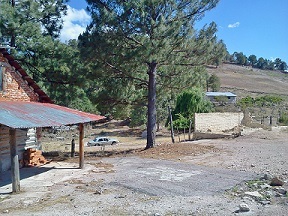 The center building (the end point of the section) is 6.0 kilometers from Nacayvo Sur. Because Cerro Alto (2480 meters) is the highest point in the area, the views span 360 degrees. 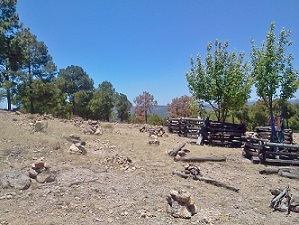 The western view is somewhat blocked by trees. 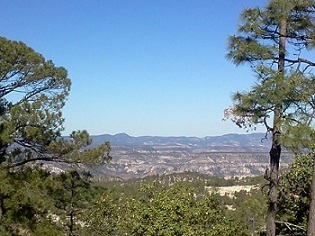 The northern view is unobstructed but focuses on the well-forested upper canyons to the North. However, the views to the East and South overlooking the deep and complex canyons of the Barrancas de Cobre region are exceptional.